The Russian Soyuz TMA-03M spacecraft – also known by its US designation of 29S – has launched toward the International Space Station (ISS) from the wintry Baikonur Cosmodrome in Kazakhstan today at 1:16 PM GMT (7:16 PM local Kazakh time), carrying three crewmembers for the station’s current Expedition 30 and future Expedition 31 crews. Soyuz TMA-03M is the third “digital” TMA-M (700 series) Soyuz to launch into space, and marks the full transition of the Soyuz to the digital era, since every Soyuz hereafter will also be of the upgraded digital variant. The upgrades consist of updated Neptun panel displays and controls, as well as lighter system components which allow for more payload (~50kg) to be launched inside the Soyuz. Following a two-day free flight, Soyuz TMA-03M will rendezvous with the ISS on Friday (23rd December), for a 2:22 PM GMT docking at the Mini Research Module-1 (MRM-1) “Rassvet”, vacated on 22nd November by the departing Soyuz TMA-02M/27S spacecraft. 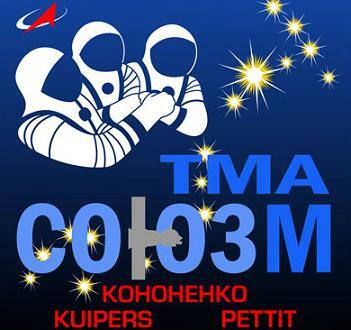 Once hatches are opened a few hours later, the current three-member Expedition 30 crew – consisting of American astronaut and ISS Commander Dan Burbank, as well as Russian cosmonauts Anton Shkaplerov & Anatoly Ivanishin – will welcome the Soyuz TMA-03M crew aboard the ISS just in time for the festive holiday period. It is tradition for crews arriving at the ISS during the holiday period to bring festive gifts for their counterparts – as was seen on 22nd December 2009, when the just-docked Soyuz TMA-17 crew entered the ISS carrying Christmas trees and wearing Santa hats. The already on-orbit Expedition 30 crewmembers have decorated the ISS for the arrival of the Soyuz TMA-03M crew. Soyuz TMA-03M is planned to remain docked to the ISS until 16th May, whereupon it will undock and land on the steppe of Kazakhstan. Soyuz TMA-03M is carrying a fairly un-typical crew, since none of the three crewmembers are military aviators, and two are from medical and research backgrounds – a shape of things to come now that the ISS has entered the utilisation era, following completion of the US segment of the station and subsequent retirement of the Space Shuttle. All three crewmembers have visited the ISS before, and all have flown on Soyuz before, with the caveat that Don Pettit has landed but never launched on a Soyuz. 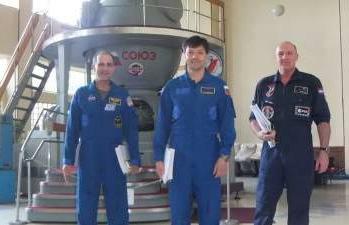 Soyuz TMA-03M is being commanded by veteran Russian cosmonaut Oleg Kononenko, who most recently flew in space during the Expedition 17 mission from April to October 2008. He flew to and returned from the ISS in the Soyuz TMA-12 spacecraft, along with fellow cosmonaut Sergey Volkov, who returned from space just one month ago aboard Soyuz TMA-02M. Kononenko, born 21st June 1964 (currently 47 years of age), graduated as a mechanical engineer from the Zhukovsky Kharkov Aviation Institute in 1988, following which he went to work for the Russian Space Agency, Roscosmos, as an engineer, prior to being selected for cosmonaut training in 1996. He is married with one son and one daughter. Upon arrival at the ISS, he will serve as Flight Engineer on Expedition 30, and command the ISS during Expedition 31, from 16th March to 16th May next year. Kononenko is also slated to perform at least one spacewalk during his second flight, having previously conducted two spacewalks during his six-month mission in 2008. Flight Engineer-1 (FE-1) on Soyuz TMA-03M is European Space Agency (ESA) astronaut André Kuipers, who was born in Amsterdam, The Netherlands, on 5th October 1958 (current age 53). He has flown in space only once before during the eleven-day DELTA mission, launching aboard Soyuz TMA-4 on 19th April 2004 and returning to Earth aboard Soyuz TMA-5 on 30th April 2004. During his mission, he conducted 21 experiments aboard the ISS for the European Space Agency. Such short missions were common in the past, since at the time the ISS was crewed by only two people in wake of the Space Shuttle Columbia tragedy, meaning that a third seat was free on each launching and landing Soyuz for an additional short-term crewmember. Kuipers earned his medical Doctorate from the University of Amsterdam in 1987, whereupon he worked at various medical institutions, including serving as an officer in the Royal Netherlands Air Force Medical Corps, and investigating data from various life sciences missions aboard the Space Shuttle. He was selected as an ESA astronaut in 1998, and is married with three daughters and one son. 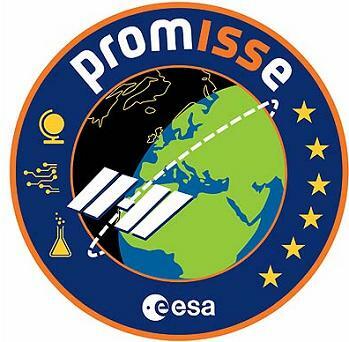 During his second space mission (named “PromISSe” in keeping with ESA tradition), which is his first long-duration flight, Kuipers will participate in multiple experiments on the ISS, utilising his medical experience in the investigation of human physiology in microgravity. Rounding out the Soyuz TMA-03M crew as Flight Engineer-2 (FE-2) is NASA astronaut Don Pettit, infamous in the space world for his passion for, skills with, and promotion of science, especially in microgravity. Born in Silverton, Oregon, on 20th April 1955 (current age 56), Dr. Pettit earned his Ph.D. in chemical engineering from the University of Arizona in 1983, prior to working at the Los Alamos National Laboratory until he was selected as a NASA astronaut in 1996. Pettit has flown two previous space flights, ISS Expedition 6 from 2002 to 2003, and Space Shuttle mission STS-126 in November 2008. His first ISS flight, Expedition 6, was not without incident. Pettit, who launched to the ISS along with fellow crewmembers Ken Bowersox and Nikolai Budarin aboard Space Shuttle Endeavour on the STS-113 mission on 23rd November 2002, was only scheduled to stay aboard the ISS for four months, returning on STS-114 in March 2003. However, during Pettit’s stay aboard the ISS, the Space Shuttle Columbia tragedy occurred, on 1st February 2003. While the tragedy was of course a tremendous loss to the Expedition 6 crew, the subsequent grounding of the Space Shuttle fleet had left the Expedition 6 crew with no ride home. Eventually, the crew was able to return to Earth two months later than planned inside their Soyuz TMA-1 lifeboat on 4th May 2003, which at the time was an untested new TMA (200 series) variant of the Soyuz. 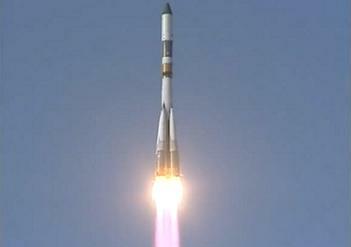 Thus, although Pettit has previously done a re-entry in a Soyuz, this will be his first launch in a Soyuz. During Expedition 6, Pettit became known for his “Saturday Morning Science” projects, which he performed in his own free time, videoed, and downlinked to Earth for public release. Now that the ISS is a fully completed National Laboratory, with scientific capabilities an order of magnitude better than they were during Expedition 6, Pettit is expected to continue his microgravity scientific demonstrations during Expeditions 30 and 31. However, with a more capable ISS comes a more maintenance-heavy ISS, and since the crews may need to conduct “Saturday Morning Maintenance” in future, Pettit has suggested that his science projects may become “Saturday Afternoon Science” this time around (a dedicated thread for coverage of Dr. Pettit’s science activities exists in the ISS Section of the NASASpaceflight Forum). Of relevance to the Soyuz TMA-03M launch was the 24th August launch failure of the Progress M-12M/44P spacecraft, caused by a premature shutdown of the uncrewed Soyuz-U booster’s third stage RD-0110 engine, due to a blocked fuel line leading to the engine’s gas generator. As much as the issue was billed as a one off, which was subsequently confirmed by the successful 30th October flight of the Soyuz-U with Progress M-13M/45P and the 14th November flight of the crewed Soyuz-FG with Soyuz TMA-22/28S, all eyes were on the Soyuz-FG booster during launch, although the RD-0110 engine used in by the vehicle has been tested and confirmed to be free of defects. The vehicle performed without issue during ascent. While the threat of a station de-crewing in wake of the Progress M-12M failure was alleviated by the successful 16th November docking of the Soyuz TMA-22 spacecraft, a successful Soyuz TMA-03M docking on Friday would put the ISS back up to six crewmembers for the first time since the 16th September departure of Soyuz TMA-21/26S, although ISS did enjoy a brief period of six crewmembers during the six day handover between the new Soyuz TMA-22 and outgoing Soyuz TMA-02M crews from 16th to 22nd November. Thus, the successful launch enables the ISS to return to stable six-crew operations by yearend, nearly four months after the launch failure of Progress M-12M, which has at best highlighted the dangers of relying on one launch system for crewed access to the ISS.